One of the toughest decisions as I was planning my wedding day look was choosing how to wear my hair. I showed you all a few of my wedding day hair inspiration photos in a previous post, but even after that post, I was not 100% sure how I would wear my hair. In fact, I changed my mind the day before my hair appointment. Thankfully, my hairstylist, Tiffany Denae, is easy going and her styling my hair was a piece of cake. I found my wedding day hair inspiration post on Pinterest, of course. I had found it and saved the image in my phone months ago. In fact, I saved it so long ago that I had forgotten about it. I happened to find it the day before my hair appointment as I was cleaning out my phone. I love how elegant the style is. 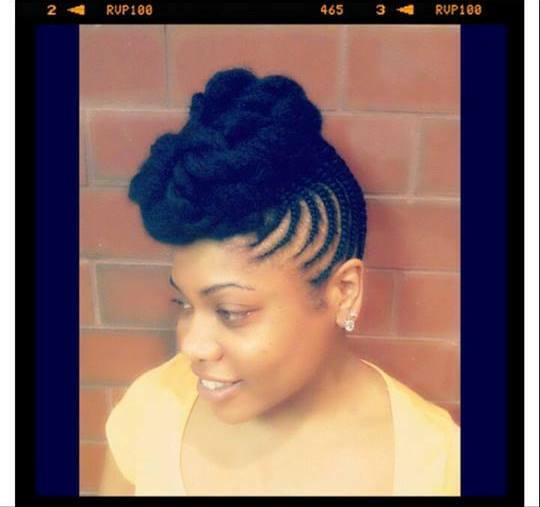 It incorporates braids as well as a soft updo. Plus, I have had my hair styled this way for four days and still holding strong! How do you like the updo I chose? How did you wear your hair or how do you envision wearing your hair on your wedding day? Hey Bride!! I think it's very cute! I know if you choose this look... you'll look beautiful. Thanks for sharing with us. Congrats to you and hubby! I love your updo and it suits you really well! I never wore an updo before and when I get married I may do it. Congrats! And your hairstyle was very nice! Thank you Louida! You would look great with an updo! Don't wait until marriage. Try one this summer. They are awesome protective styles.